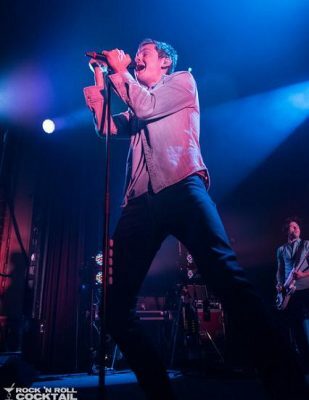 Thanks to Jason Miller for this awesome pic of Tom Chaplin killin’ it! Have you ever seen something advertising a band playing in your city, and thought, “I’d really like to see them, even though I only know one or two of their songs”? That was the extent of my relationship with Keane until recently. I’ve certainly heard several of their songs on the radio over the years, and especially love their biggest hit, “Somewhere Only We Know,” but until I found out I had access to check them out with opener Youngblood Hawke this weekend at San Francisco’s Warfield, I hadn’t actually sat down to give their tunes a thorough listen.When Youngblood Hawke took the stage, they were all energy, especially front man Sam Martin. They began their set with “Rootless,” after which Sam paused to greet the crowd, asking, “you guys know it’s Friday night, right?” Up next was a song called “Danny,” followed by “Blood,” “Come Looking,” and “Protect.” Taking a breather between songs, Sam explained that it was only the band’s second time playing San Francisco, which is understandable given that this particular assembly of band members has only been together as Youngblood Hawke since late 2011. After “Stars,” Sam said, “if you guys know this one, sing along. If not, I won’t be upset!” The song, “We Come Running,” is a deliciously catchy rockin’ pop tune – the kind that gets stuck in your head for days, but you don’t really mind because it’s a great song. Promising a few more songs for us, Sam said, “SF, you are sweethearts. There’s lots of love in this place! Are you having a good time?” As far as I could tell, the cheer that rose up in response was a clear yes. “Forever” came next, followed by “Glacier,” which ended in a drum-fest: everyone had a drumstick and was pounding away, creating a very memorable sound and sight. The best part: when they were done, they humbly reassembled on the stage to break down their own set. Maybe it’s the little things, but I love a great band who’s not afraid to get in and get their hands dirty. Expect to hear great things from this band soon! “Day Will Come” is such a damn catchy song, I can find no reason not to love it. It’s positively “infectious,” as the cliches like to go about such pop ditties. 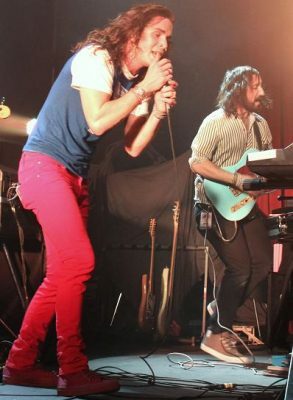 As he sang it, I took a few notes about Tom’s stage persona: the guy is a class act. He’s unbelievably comfortable, both on stage and in his skin. His talent appears effortless; he clearly enjoys himself, all while staying absolutely cool as a cucumber. Nice. When “Disconnected” began, Jason and his wife cried out in excited unison, dancing to it together as Jason told me it was the “best Keane song ever!” The alleged “last song” came next, as Tom asked anyone still seated to “get up!” for “Is it Any Wonder?” which is an easy fan favorite for it’s irresistible melody. As it closed, Tom bowed quickly, nodding with all the sincerity of true humility and appreciation. “This is the Last Time” was next, gorgeous with the piano, and more than once during “Somewhere Only We Know” (the only song, up till this point, that I knew all the words to) I got legitimate goosebumps: it’s just that good. I’m not a girl who’s overly romantic or mushy, it’s just the kind of song I can’t really resist: the lyrics are wistful and nostalgic without being cheesy, and the music is just right. Seriously, the song is nearly ten years old now, and I still crank it up every time I hear it! It’s everything I want in a great big pop-rock tune, and all I wanted it to be that night and more. After saying goodnight to Jason and his wife, I hurried out into the chilly downtown San Francisco air and cranked up two things immediately in my car: the heat, and Strangeland. It’s such a wonderful experience to hear a band you hoped you’d love live and come away more excited about them than ever. I already can’t wait to see them again!